Data analytics is the practice of embedding insight into operations to drive business strategy and performance. With the tools already existing in CRM, ERP, CMS and CPM operational systems, modern capability to collect and distribute data has increased to become more cost-effective, easier, and important than ever before. It has become such an inherent part of daily business activities that many organizations are just collecting the data and not even knowing what to do with it. Despite the intimidating and ever-growing mountains of data available, the key to increased performance lie in analysis and implementation. The traditional approach to business analytics is corrective, driven by instinct, long trend-following periods of weeks, months and years and is manually intensive. Top performers are shifting from traditional approaches to more strategic, sophisticated and reliant approaches that entail the adoption of data analytics, making the business processes more directive, fact-driven, agile, active and empowered. Data analytics should keep you well informed and capable of making strategic decisions in a timely manner. 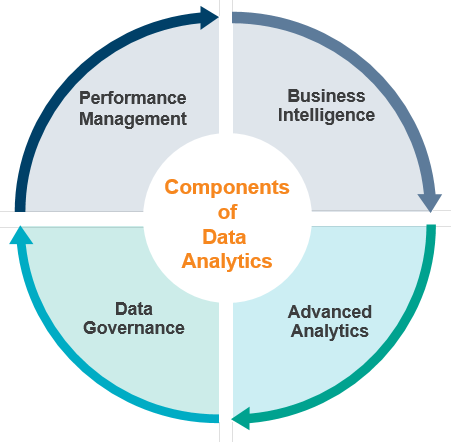 The capabilities of data analytics include performance management to describe the methodologies, metrics processes and analytical applications monitoring and managing business performance; business intelligence to help solve queries and report answers to questions; advanced analytics, including data mining, pattern matching, data visualization, predictive modeling and machine learning to answer why something is happening, if trends will continue and what will happen next; and finally, data governance for developing and executing architectures, policies and procedures to manage the collection, quality, standardization, integration and aggregation of data across the enterprise. What is the Value of Data Analytics? Data analytics offers deeper insights within business functions. For example, finance analytics drives budget account ability, timely and in-context financial and cost information, accurate forecasting of cash flows and tracks key metrics through financial dashboards. Sales analytics offers improved pipeline visibility, accurate forecasting, increased cross and up-selling, and quick opportunity/threat identification. Marketing analytics identifies high-potential segments, maximizes return on marketing spend and tracks campaign results for more predictive success. Service analytics improves customer service, drives efficiency and lowers costs and provides single view of customer and customer behavior. If each of these were functioning at their highest possible rate, the benefit to business is obvious. Check out this guide for information on relevance to CFOs and financial business processes, information frameworks and data analytics trends.